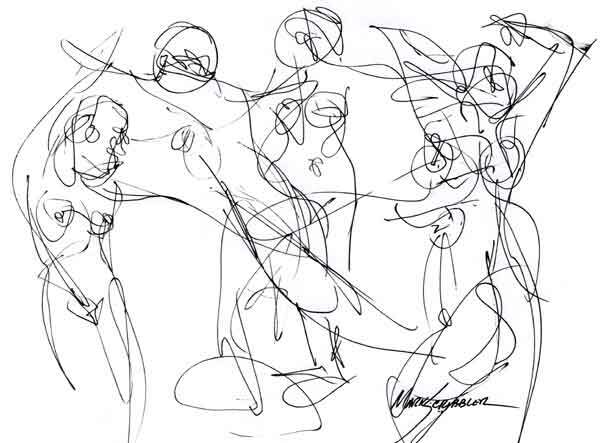 A pen and ink sketch , Five Views of a Dancer by Mark Scribbler. on Pentalic Paper for Pens, 2001. Whenever you need anything, once a month at the full moon, assemble in the wilderness--in the forest, on the heath, by the seashore--for the state of nature is a community of freedoms. Recognize the imminence of total liberation, and as a sign of your freedom be naked in your rites. Dance and sing, laugh and play, feast on the fruits of the earth, the delights of my body, make music and love--for all acts of pleasure are my rituals. And I am that which you find in the fulfulment of desire.